It seems as though as each of the milliseconds go by, the wonderful and radiant Isabela Moner continues to get more and more talented. The remarkable actress and singer brought her outstanding vocals and vivacious presence as she performed at Fox 5 NY on December 22, 2015. The “100 Things To Do Before High School” star got everyone in the holiday spirit with her spectacular and jolly Christmas performance. Isabela Moner looked so gorgeous, as usual, wearing a lovely black shirt with bows and a checkered skirt. 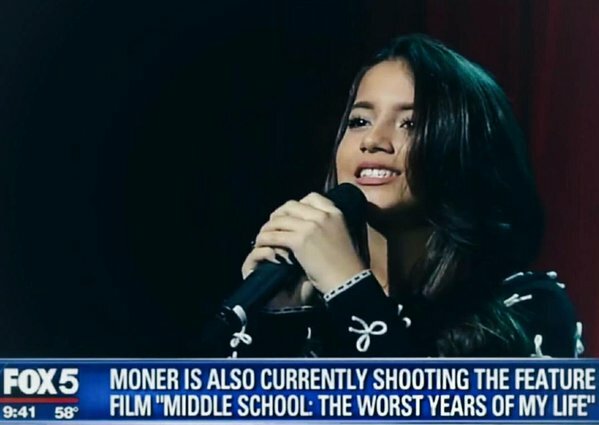 Isabela Moner is truly one gifted young lady who is taking both the music and acting world by storm. With her indescribable talent and her amazing charm, this dazzling, young lady will definitely have another magnificently successful year in 2016! Congrats on an excellent performance, Isabela! Previous Article: Brec Bassinger Spills On What Is At The Top Of Her Holiday Wish List – And It Happened Today! Next VIPAccessEXCLUSIVE: Hunter Hayes Exclusive Interview With Alexisjoyvipaccess At The TJ Martell Foundation Family Day NY!